Storage Capacity – Is there enough compartments to store your clubs, tees, gloves, towels, shoes and other essentials. Protection – You need enough padding to protect your golf equipment safely in transit. Mobility – Are you able to move your golf travel bag around easily and freely? Size – Everything needs to fit in your bag snugly, without the need for struggle. Features – We rate the design, security and optional extras included with your travel bag. Score – We weigh up the pros and cons, and provide an unbiased review. Value – Does the value make these the best golf travel bags? So, now lets see which Golf Travel Bags have made our list. Samsonite are an established luggage company creating over one hundred years of reliability, durability, style and innovative functionality have made Samsonite’s iconic products, and brand, the global leader they are today. Today however we’re looking into their sporting range, more specifically their golf bags. We will review the Samsonite Hard Side Golf Travel Cover. Samsonite provide high quality travel equipment, and this is no exception to the standards they set. The casing boasts a durable, yet lightweight, solid ABS shell that protects your golf bag and clubs from the rigorous abuse of air travel. This cover can accommodate larger 10.5″ golf bags (the diameter) and up to 48″ clubs providing good capacity. You will see the external contains heels and studs enabling a sturdy standing position. Mobility wise, the bag features four multi-directional in-line skate wheels meaning the cover can easily be pushed or pulled without hindrance when transporting. There are two plastic injected handles attached to the case. The zipper is D shaped meaning a padlock can easily be added for security. Inside, the interior is padded and quilted with polyester 150D/2 layers of PU Coating with extra foam cushioning at the top to add protection to your golf clubs. Internal compression straps secure your golf bag. The dimensions are 54 x 16 x 12 inches which is similar to most cases. Pros: Excellent protection, lightweight, very spacious, durable zipper, it looks good! A Samsonite bag is a reliable purchase. The brand makes sure that all its products are top quality, durable cases. Don’t beleive me. Take a look at this clip. The Plano Golf Guard Case stand out features include space for your golf club bag of up to 11″ in diameter, in its so spacious that it can easily hold your driver up to a length of 46″ – not bad for a hard golf travel case that costs less than a family meal. In fact this is definitely the best golf travel bag for the money. The extra storage this case provides means that other accessories from tees to balls to towels will snugly fit in. The exterior is moulded and the structured ridges suggest this case would take one hell of a beating to render it unusable. Although not the greatest looking case on the market, it’s more than capable of doing the job it was made for – protecting your prized golf equipment. Towards the base of the case, we notice two in-line wheels which are made of plastic, not rubber which could suggest they are cheap and cheerful. Handling is managed by two comfort grip handles at the top of the case meaning it can be pushed and pulled through doors or across airport lounges without any problems. From a security point of view, we notice there are 3 metal bail latches keeping the case sealed and locked tight. They seem big enough to be compatible with heavy duty padlocks to give you piece of mind. The Plano Golf Guard measures 51 by 14.5 by 12.75 inches (W x H x D) and weighs in at 13 pounds (when empty!). Pros: Sound protection, solid case, price is good. Cons: Can weigh 11kg when fully packed. Wheels seem flimsy. 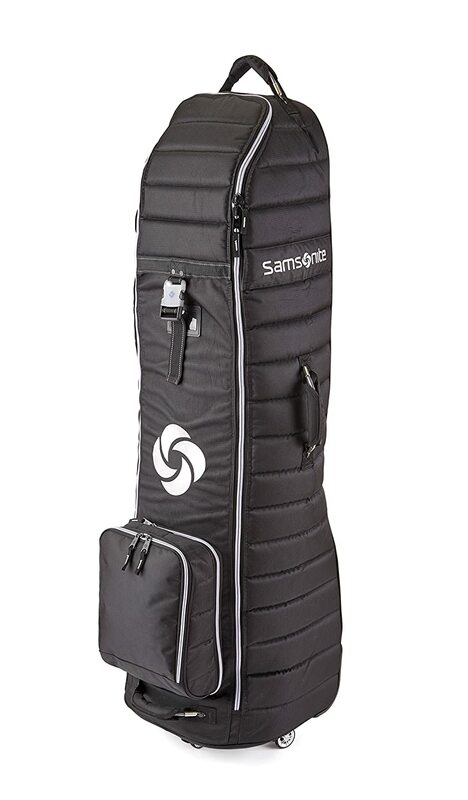 The second Samsonite Travel case on the list is the Samsonite Spinner Wheeling Golf Cover- its name taken from the three multi-directional spinner wheels which allow the bag to glide effortlessly during transit. Our first noticeable impression of this case is that it is constructed from super strong box weave nylon, and not the typical polyester which most golf bags seem to be made from making it look very fashionable and certainly more noticeable – it does make the bag look square and adds more weight (about 3lbs or so) to the cover. The tapered shape does provide a better fit. A positive point to make is that the bag holds clubs of up to 48″ and a golf bag with a maximum diameter of 10.5″ will fit comfortably inside the case. On the subject of storage space, the golf travel spinner has a very decent sized shoe pocket which would easily hold your golfing shoes, towels, tees and other accessories without a problem. A novel idea is the pocket is removable in case the need arises to detach it (for storage purposes or luggage allowance at the airport). The zippers seem standard – the bag opens all the way down and around giving you good access to your equipment/golf bag. As the name of the case suggests, the multi directional wheels easily support the weight and seem sturdy and secure. There are two in-line skate wheels built in to the base giving you another mobility option. There is a main padded carry strap, and a couple of handles which are riveted giving them more strength and durability. For the price you pay, the Samsonite Golf Travel Spinner is a good, solid all around golf travel cover with style. West Coast Trends, Inc. was founded in 1990 by Jeffrey Herold, an entrepreneur, avid surfer, golfer and pilot. While surfing, Jeff wanted to fill a void in the golf marketplace and envisioned transforming his wetsuit into head covers. Soon after he introduced a line of premium neoprene head covers – aptly named The Club Glove – which quickly became popular with golfers of every skill level. Realizing a need for a quality golf travel bag, Jeff spent nearly a year designing the sturdy, dependable “Last Bag.” Again aptly named as it may just be the “last bag” for travel you ever have to buy. This legendary travel bag is currently used by more than 90 percent of PGA Tour players, and was named one of the top 10 innovations in golf in the last 20 years by Golf Digest. Proudly made-in-the-USA, Club Glove products are preferred by the overwhelming majority of professional golfers on all U.S. Tours. In some capacity Club Glove products have been used by every USA Ryder Cup team since 1997. Club Glove also crafted unique staff bags for all Team USA members and coaches during the 2004 and 2006 Ryder Cups. The company’s success continued as Jeff enhanced his product line, introducing premium golf bags in 2001. In response to countless requests from club and Tour professionals, the highly-acclaimed Aficionado IV stand bag and the luxurious FCO cart bag were launched. Club Glove products are seen on golf courses worldwide and momentum continues to build as Jeff expanded his offerings to general consumers with Train Reaction luggage, the Train Reaction Device and dozens of travel bags, clothing organizers and accessory kits. The Club Glove Burst Proof With Wheels 2 is certainly one of the best golf travel covers we’ve come across. Made using the legendary burst proof CORDURA fabric which is 3 times stronger that standard polyester and lasts up to 5 times longer. Club Glove have given this a 5-year warranty its that good. The first thing you may notice about the bag is the lack of an external pocket – no need to panic, as there are two shoe pockets located inside, meaning one lock will secure everything. Transporting the bag could not be easier – its fitted with in-line skate wheels with bearings and a high impact plastic wheel base that cradles and shields the bottom of the bag. Strong riveted carry handles are also fitted onto this cover. The base is reinforced with ballistic nylon giving you much better protection. The zipper is split providing you with easy and immediate access to your golf equipment of which up to a 48″ driver can be accommodated. Upon looking inside, you will notice there is an adjustable restraint device, with 2″ webbing, which will keep your golf bag firmly in place. It is also lined with extra thick foam padding. This burst proof bag is available in a variety of colours including black, navy, yellow, green and more. This Golf Travel Cover, made by Intech has been given a review score of 90 out of 100. 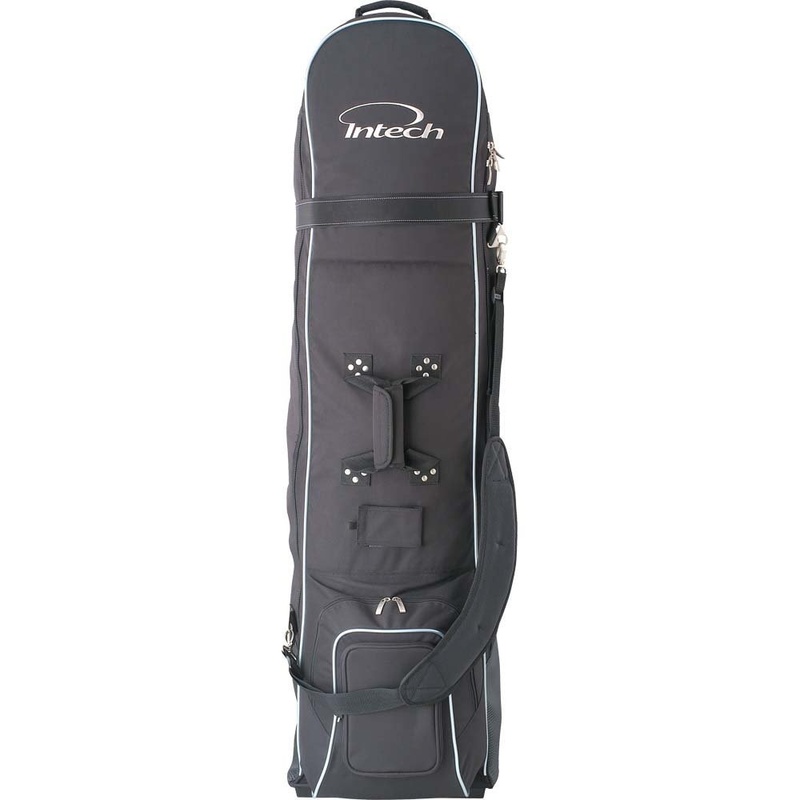 With some great features included, this golf bag is makes a perfect travelling companion. It’s constructed from heavy duty, water resistant polyester like most other travel covers. The wheels are molded into the base providing smooth rolling transportation. If you prefer to carry the bag, there are riveted top and front end carrying handles reducing the chance of them snapping. The shoulder strap is padded which is brilliant as there is nothing worse than a bad shoulder from carrying all that weight! An ID tag holder is located at the front for simple identification. Storage wise, there is an external zippered pocket for your shoes, accessories and such. This can be locked if required. Internally, the main section is nicely padded out to protect your treasured golf clubs. Summary: A good all round choice, for just over $50 – a good pick if your on a budget but looking for that added protection and security. Next Post:Golf Chipping Tips – stop those miss-hits!